Barcelona City Tour Bus - Bus Turistic vs Barcelona City Tours? A guided bus tour is a convenient way to see the sights of Barcelona. These are much easier to use than city public transport, and can help you work out the best things to see without hours of research! There are two main options for bus tours in Barcelona(Barcelona City Hop on hop off tour, Barcelona Bus Turistic Tours), They both have similar service, vehicles and are both centered in Placa de Catalyuna. They have slightly different routes, so check out which you think suits you best. Also, the Bus Turistic offers a separate route in high season for Port Olympic. Another factor that may guide your choice is that these tickets are both included in different city discount attraction passes. Buying one of these offer great value! Check out our guide to these passes. Where to Buy Barcelona Hop-on Hop-off Bus Tour? Where to Buy F.C. Barcelona & Hop-On Hop-Off Bus Tours Tickets? Where to Buy Picasso Museum & City Bus Tour Tickets? Barcelona City Tour is a hop on hop off sightseeing tour bus which runs in two routes- East Route and West Route. These red coloured buses stop at almost all the major attractions of Barcelona. Buses offer free Wi-Fi access, maps and guides, an on-board attendant, and have modern buses with ergonomic seats, electric roofs. They are well adapted for people with limited mobility. Barcelona Bus Turistic offers tourists to hop on and on hop unlimited times and let them plan a perfect itinerary. These are blue coloured buses which run in three routes- Red Line, Blue line, and Green Line. The buses also offer free Wi-Fi access, information booklet, an on-board attendant, ergonomic seats, electric roofs. They are well adapted for people with limited mobility. Discover Barcelona aboard the open-top double-decker hop-on-hop-off bus to see the amazing side of this Mediterranean city. This 24-hour tour is a combined with a visit to the large and unfinished Roman Catholic church in Barcelona city designed by the renowned Antoni Gaudi, a Catalan architect. You get to marvel at the modern buildings to the great Olympic city, Mediterranean sea and the great cuisine in Barcelona. The hop-on-hop-off bus tour offers audio commentary to tourists in 10 languages with free headphones, hop-off at any of the stops between 3 routes and 44 different stops to explore further. This is an awesome way to see the sights. Experience Barcelona and save money with a combined Hop-on Hop-off Bus and a visit to the Picasso Museum! See all the highlights of this beautiful Mediterranean city and its beaches. This open-top double-decker panoramic bus conveniently offers journeys across 3 routes (Red, Blue and Green routes) with over 45 stops. The bus offers free headphones to tourists to listen to the audio guide in 16 different languages. Hop-on and off at any of the stops to explore on foot and marvel at one of the most visited art museums in the world. Enjoy free Wi-Fi onboard the bus with just a 24-hour Bus Hop-on Hop-off bus and Picasso Museum tour combined ticket. The F.C. Barcelona & Hop-On Hop-Off bus tour Combo-ticket offers a whole to see around this astonishingly beautiful city. You can hop-on and hop-off at any of the 2 routes and 40 stops with one just one ticket. Choose between a 1 or 2-day ticket to see and learn about the history of Barcelona on board the open-top double-decker bus. The bus is fitted with panoramic windows and anatomical seats to enhance your view while relaxed. Get free headphones to listen to the multilingual audio commentary, a guide map in hand with all the stops and routes, discounts and more. People with disabilities are not left out of the fun as the buses are suitable for them. You can enjoy skip-the-line entry to the renowned FC Barcelona Stadium and Camp Nou Museum which has some of the best collections of football memorabilia worldwide. 3 Hop on hop off Routes, the Red & Blue line/route takes about 120 minutes while Greenline/route takes 40 minutes. Red, Green and Blue Routes: 9am to 8pm (9am to 7pm in winter). Tuesday to Sundays: 9 am to 8.30pm (except Thursdays). Winter (1 Nov - 28 Feb): Buses operate from 9:00am - 7:00pm. 15 Oct 2018 - 16 Dec 2018: Monday to Saturday; 10:00am to 6:30pm and Sunday; 10:00am to 2:30pm. With Barcelona Hop-On, Hop-Off Tour/Sagrada Familia ticket, tourists can board the bus from any of the approved bus stops; by showing your voucher to the bus driver. For tourists arriving in Barcelona by a cruise ship, there are shuttle services from the port to two of the closest tour stops, World Trade Center (Stop 15) and Museo Maritim (Stop 16). For more information about the shuttle services, visit the cruise desk at the Cruise Port Terminal to get specific directions. For Sagrada Familia Skip-the-Line Access, tourists have to make their way to the Sagrada Familia. You can start/end the tour at any of the approved stops, using the blue City Sightseeing buses. F.C. Barcelona Museum/Camp Nou Experience & tour: First floor of the museum. Red route: Takes you from Placa Catalunya to Parc de la Ciutadella, Diagonal, Passeig de Gracia, Montjuic Estacio de Sants, and Port Vell. Green route: From Port Olimpic to Poblenou, the Forum area while admiring the beaches along the way. Blue route: Takes you from Placa Catalunya to MACBA, Passeig de Gracia, Gracia, La Sagrada Familia, Tibidabo, Park Guell, Pedralbes, and the FC Barcelona football ground. Green Line (Seasonal Route - Only operates between March - November). Placa Catalunya, Catedral-Barri Gotic, Port Vell, Museu d'Historia de Catalunya, Barceloneta, Port Olimpic, Platja del Bogatell*, Nova Mar Bella*, Forum*, Glories-Torre Agbar, Sagrada Familia, Recinte Modernista St. Pau, Park Guell, Tibidabo, La Pedrera, Casa Batllo. (*) Winter Tour (2 Nov - 25 Mar): The stops are replaced by Ciutadella-Zoo and Teatre Nacional-Auditori. Placa Catalunya, Arc de Triomf, El Born- Ciutadella-zoo, Passeig Colom, World Trade Center, Jardins de Miramar, Fundacio Joan Miro, Anella Olimpica, MNAC Museo Nacional de Catalunya, Poble Espanyol, Caixa Forum-Pavello Mies Van Der Rohe, Placa d'Espanya, Estacio de Sants, Camp Nou (F.C. Barcelona), Placa Pius XII-Palau Reial- Pavellons Guell-Monestir de Pedralbes, l'Illa Diagonal, Av. Diagonal, La Pedrera, Casa Batllo, Placa Catalunya. Yes (Multi-lingual Audio guide) Languages: English, Catalan, Spanish, French, German, Italian, Japanese, Chinese, Portuguese, Russian, Dutch, Finnish, Swedish, Arabic, Hebrew and Turkish. Yes (16) Languages: English, Arabic, Catalan, Spanish, Finnish, French, German, Portuguese, Chinese, Japanese, Italian, Russian, Norwegian, Swedish, Turkish, and Dutch. Yes (15) Languages: Spanish, Swedish, Catalan, Chinese, Dutch, English, French, German, Hebrew, Hindi, Italian, Japanese, Arabic, Portuguese, Russian. €200 of discounts in information booklet. Wheelchair accessible, Sliding roof during rain, Discount-voucher booklet with savings up to 200 Euros. One entrance ticket to F.C. Barcelona Camp Nou Museum and Tour. Green Route is a seasonal route from March to November. get to the museum by Barcelona Bus Turistic (red line), stop \91Barri Gotic. The Camp Nou Experience is not suitable for people with physical disabilities due to a large number of staircases on the tour. There might be changes in the schedule, routes or closure of some part of the museum tour due to training sessions, matches, or special events. The Camp Nou Experience is closed on Spanish League and Champions League matchdays. Print the voucher in your mail and show it directly to the conductor of the bus. Print the voucher in your mail and exchange it at any Barcelona Bus Turistic bus stops. You will need to print your booking voucher from your mail and present to the bus conductor. To use the Combo-Ticket, you need to choose a day for the bus ticket and a timeslot for a visit to the Picasso Museum. Print the voucher or use electronic bus and museum tickets directly on your mobile to get access. You will need to exchange your vouchers for the entrance tickets to the hop-on-hop-off bus tour and Camp Nou Experience at the local operator's office at Balmes 5, Barcelona. Or go along with a printed version of your voucher to get access the Camp Nou Experience and Hop-on Hop-off bus tour. Where to Buy Barcelona City Tours(Gray Line)? We are comparing the Best Barcelona Hop On Hop Off City Sightseeing tour Prices from leading online Tours and Ticket suppliers, try to find you cheap tickets prices on the market. Explore Barcelona and discover its ancient and modern architecture with the convenient and flexible Barcelona Bus Touristic City Sightseeing Tours. With a 1 or 2-day ticket, enjoy the comfy touristic bus along 3 routes and 40 stops in all. Tourists can hop-on and off as many times as they want and at any of the tour stops to discover and see the highlights in Barcelona. See some of the best attractions, landmarks, and monuments at their leisure or stay on the touristic bus for the full duration of the tour - which is up to you! Admire places like Gothic Quarter, Park Guell, Casa Mila, Sagrada Familia, and La Ramble just to name a few. Enjoy discounts enjoying shows, shopping at selected stores, museums, restaurants, day trips and all kinds of leisure activities in Barcelona. Hop-on and off any time you want at any of the stops to explore on foot. Admire the underwater life at the aquarium, Casa Batllo, La Pedrera and FC Barcelona's museum, the Camp Nuo experience. Tour Barcelona on a choice of 3 routes and get the most out of your visit. Get a free map guide and headphones to listen to the onboard audio commentary in 16 different languages. Hop-off the bus for a walking tour and explore FC Barcelona's museum, the Camp Nou experience. This ticket gives you discounts at some selected restaurants, shops, shows, attractions and leisure activities in Barcelona. How Much is a 1/2/3 Day Barcelona Bus Touristic City Sightseeing Tours? All children under 4 years ride the Barcelona Bus Touristic for free. We are comparing the Best Bacelona Touristic Blue Bus Tours Prices from leading online Tours and Ticket suppliers, try to find you cheap tickets prices on the market. Bus stops: Plaza de Catalunya, Casa Batllo-Fundacio Antoni Tapies, Passeig de Gracia-La Pedrera, Francesc Macia -Diagonal, Estacio de Sants, Creu Coberta, Plaza dEspanya, CaixaForum-Pavello Mies van der Rohe, Poble Espanyol, Mnac, Anella Olimpica, Fundacio Joan Miro, TelefÃƒÂ¨ric de MontjuÃƒÂ¯c, Miramar-Jardins Costa i Llobera, World Trade Center, Colom-Museu Maritim, Port Vell, Museu dHistoria de Catalunya, Port Olimpic, Platja del Bogatell-Cementiri del Poblenou, Parc de la Ciutadella-Zoo, Pla de Palau, and Barri Gotic. Bus stops: Plaza de Catalunya, Casa Batllo-Fundacio Antoni Tapies, Passeig de Gracia-La Pedrera, Sagrada Familia, Gracia, Park Guell, Tramvia Blau-Tibidabo, SarriÃƒÂ , Monestir de Pedralbes, Palau Reial-Pavellons Guell, Futbol Club Barcelona, and Francesc Macia -Diagonal. 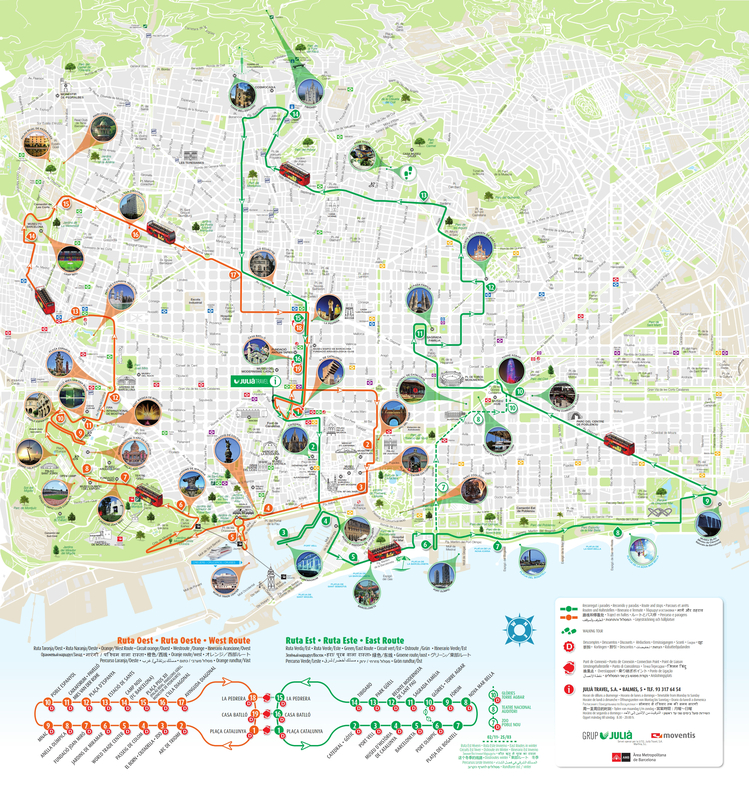 Bus stops: Macba-Cccb, Port Olimpic, Platja del Bogatell-Cementiri del Poblenou, Poblenou (direccio Forum), Parc Diagonal Mar (direccio Forum), Forum, Parc Diagonal Mar (direccio Centre), Poblenou (direccio Centre), and Platja del Bogatell-Cementiri del Poblenou. TripAdvisor Reviews: with the average rate of 4.0 by its former users, the Barcelona Bus Touristic City Sightseeing Tours service ranks very well. The number of dissatisfied travelers is far below those that are very satisfied. The overall number of reviews is 4,455 and 47% of participating tourists rated the bus tour as excellent. While 33% gave it a very good rate. Viator: Those who bought the Barcelona touristic bus tour tickets on this website gave it a 4.5 rate based on past experience. This is a very impressive review with 2,467 reviewers. Get Your Guide Reviews: Most people who got their tickets for the Barcelona Bus Touristic City Sightseeing Tours through this website rated it a 4. (1,428 reviewers) rate. The Barcelona Bus Touristic City Sightseeing tours is just an amazing and magnificent way of discovering the culture, history, architecture, and nightlife in the beautiful Catalan city of Barcelona. This touristic bus service offers audio guides in 16 different languages, a map guide to help tourists navigate to the attractions in the city without missing any interesting stuff. The open-top double-decker bus is equipped with air-conditioning and onboard Wi-Fi to update your social handles and also enjoy the panoramic views atop the open-top. Choose between the 1 or 2-day tickets and explore Barcelona at your own pace, tourists can hop-off the bus touristic at any time and at any of the stops to take closer looks at the sights. Visit the famous FC Barcelona stadium Camp Nuo and its museum the Camp Nuo experience, Parc Guell, Cathedral of the Holy Cross, Port Olimpic, and the Aquarium to admire the beauty of underwater life. You also get a discount booklet for use at attractions, restaurants, shows, shops and leisure activities. Is the Barcelona Bus Touristic Hop on hop off Right for Me? This Barcelona Bus Touristic City Sightseeing Tours is a proper way to introduce tourists to the city of Barcelona. Aboard the bus, you get comfy with air-conditioning and see numerous attractions, monuments and beautiful places with an onboard audio guide explaining every attraction along the 3 routes in 16 different languages. The double-decker open-top bus touristic comes with a 1 or 2-day ticket which you use to get access to many museums and attractions. You get free Wi-Fi and you can hop-off at any point of interest at any of the 40 stops for a close and personal walking tour. Upon purchase of the Barcelona Bus Touristic City Sightseeing Tours ticket, you get discounts attractions, shops, shows, leisure activities and restaurants. Visit places such as the FC Barcelona Camp Nuo and its museum, the aquarium, Casa Batllo, and La Pedrera. It is just the best for both first-time and previous visitors tour, enjoy, and relax in Barcelona. Explore Barcelona, one of Spain's most beautiful places to be in the Barcelona City Hop-on Hop-off Gray Line Bus and discover the city's charms. Hop-on and off as many times at any stop you feel like and visit places at your own pace. With a 1 or 2-day ticket, you enjoy this double-decker open-top hop-on-hop-off bus tour with access to 2 routes and stops at some of the best sites in Barcelona with audio commentaries in 12 different languages explaining the city's history and culture. With just a ticket, you get access to two routes, audio commentary in 15 languages. Jump off anywhere you fancy, and get a complete overview of Barcelona, then jump back on the next bus available. Hop-off the bus for your own personal walking tour and visit the FC Barcelona's Camp Nou. This ticket gives you discounts at restaurants, shops, and attractions in Barcelona. How Much is a 1/2/3 Day Barcelona City Hop-On Hop-Off Gray Line Bus Tours? All children under 4 years ride the Barcelona open bus for free. Bus stops: Plaza Catalunya, Catedral-Barri Gotic, Port Vell, Museu d'Historia de Catalunya, Barceloneta, Platja del Bogatell, Nova Mar Bella, Forum, Glories-Torre Agbar, Sagrada Familia, Recinte Modernista Sant Pau, Park Guell, Tibidabo, La Pedrera, and Casa Batllo. Bus stops: Plaza Catalunya, Arc de Triomf, El Born- Ciutadella-zoo, Passeig Colom, World Trade Center, Jardins de Miramar, Fundacio Joan Miro, Anella Olimpica, MNAC Museo Nacional de Catalunya, Poble Espanyol, Caixa Forum-Pavello Mies Van Der Rohe, Plaza d'Espanya, Estacio de Sants, Camp Nou (F.C. Barcelona), Plaza Pius XII-Palau Reial- Pavellons Guell-Monestir de Pedralbes, l'Illa Diagonal, Av. Diagonal, La Pedrera, Casa Batllo, and Plaza Catalunya. TripAdvisor Reviews: with the average rate of 4 by its former users, the Barcelona City Hop-On Hop-Off Gray Line Bus Tour service ranks very well. The number of dissatisfied travelers is far below those that are very satisfied. The overall number of reviews is 2,064 and 45% of participating tourists rated the bus tour as excellent. While 33% gave it a very good rate. Get Your Guide Reviews: Most people who got their tickets for the Barcelona City Hop-On Hop-Off Gray Line Bus Tours through this website rated it a 4. (1,428 reviewers) rate. The Barcelona City Hop-on Hop-off Gray line tours is a wonderful way for tourists to soak in the Catalan city of Spain. This tour bus has a lot which shows that it cares about tourists, with a 1 or 2-day ticket, tourists enjoy free Wi-Fi and audio tour guide in 15 different languages which explain every attraction along the 2 routes. Tourists can hop-off as many times as they wish and hop back on at the next stop, it is flexible and a fun way of discovering Barcelona. Tourists get to visit places like Camp Nuo - home to the Barcelona Football Club, Parc Guell garden complex, Port Olimpic marina, Cathedral of the Holy Cross and Saint Eulalia, and the Aquarium to admire the beautiful life underwater. The Gray line bus comes with an electric roof to stop the rains from drenching tourists onboard the open top double-decker. You get to plan your tour at your own pace to get a complete overview of the city Barcelona with discounts on attractions, restaurants, and shops. Is the Hop-On Hop-Off Barcelona Grayline Bus Tours Right for Me? This Barcelona City Hop-On Hop-Off Gray Line Bus Tours is a great way to discover the city's numerous attractions and monuments. This double-decker open-top tour bus is equipped to cater for you while onboard. With your 1 or 2-day ticket, you get an audio guide in 15 different languages which gives you an insight into the city's attractions, monuments, and history. You also get a panoramic view of the city and a choice to hop-off at any stop that interests you for a walking tour on your own with a map in hand so you don't miss any attractions and then board the bus at the any of the stops ahead. While onboard the bus, you get free Wi-Fi to share the interesting monuments in Barcelona to friends and family on social media. The Barcelona City Hop-on Hop-off Gray Line Bus Tour ticket comes with a discount booklet which you can use to get discounts at attractions, shops, and restaurants. This is an effective way to spend your time and money in Barcelona. Discover Barcelona aboard the open-top double-decker hop-on-hop-off bus to see the amazing side of this Mediterranean city. This 24-hour tour is a combined with a visit to the large and unfinished Roman Catholic church in Barcelona city designed by the renowned Antoni Gaudi, a Catalan architect. You get to marvel at the modern buildings to the great Olympic city, Mediterranean sea and the great cuisine in Barcelona. The hop-on-hop-off bus tour offers audio commentary to tourists in 10 languages with free headphones, hop-off at any of the stops between 3 routes and 44 different stops to explore further. This is an awesome way to see the sights. See major attractions like Gaudi's Sagrada Familia, La Sagrada Familia Towers, Park Guell, The Museum of the History of Catalonia and many more. Enjoy audio commentary in multiple languages, an English and Spanish speaking bus attendant. How Much is a 1/2/3 Day Sagrada Familia & Sightseeing Tour? Note: Infants under 3 years get on the Barcelona Bus Tour for free with the company of an adult. Casa Batllo and many more. Where to Buy Sagrada Familia & City Bus Tour Tickets? Based on reviews by previous users of this bus tour, it has been given a very good review rating of 4.5 by 1,102 reviewers. The Ticket Sagrada Familia & Hop on Hop off Bus tour is a 1-day round trip around the Mediterranean city of Barcelona. It is a popular Barcelona hop-on-hop-off bus with 3 routes (Red, Green and Blue Lines) and over 40 stops across the city. The bus tour is designed to make you marvel at all the city's major attractions some of which include Sagrada Familia & its tower, Park Guell, Placa de Catalunya, FC Barcelona Stadium (Camp Nou), Tibidabo, Casa Batllo, La Pedrera, Joan Miro Foundation and many more. The open-top double-decker buses are fitted with panoramic windows for 360-degree viewing. Tourists get free headphones to listen to the onboard audio commentary in over 15 different languages, a complimentary map and guide of Barcelona city and a €200 worth of discount coupons to use at attractions There is a Spanish and English speaking attendant onboard, the tour bus has an electric roof for prevention of rain at the top deck, and a ramp to aid wheelchair owners aboard the bus. The tour takes a total of 2-hours for the Red and Blue line, and 40 minutes on the Green line. Is the Sagrada Familia & City Bus Tour Right for Me? This Ticket Sagrada Familia & Hop on Hop off Bus Tour is suitable for all individuals from children to adults to seniors. It is an amazing way to see Barcelona and Sagrada Familia, Gaudi's 144-year-old unfinished masterpiece estimated to be completed by 2026. With the 24-hours ticket, you enjoy a hop-on-hop-off bus tour across the city along 3 different routes (Red, Green and Blue lines) with audio commentaries in over 15 different languages through free headphones provided for you. You also get express entry into the Sagrada Familia and its tower, free Wi-Fi onboard the bus, panoramic views of Barcelona, a stop at Camp Nou (FC Barcelona's Stadium), Casa Batllo, La Pedrera, Joan Miro Foundation, Park Guell, Placa de Catalunya and more. You get to enjoy discounts at attractions worth €200 and a complimentary map and guide of the city so you can explore on foot as you hop-on and off the bus for as many times as you want. This is just a smooth way to see this beautiful city. Travel across Barcelona with the F.C. Barcelona & Hop-On Hop-Off bus tour Combo-ticket, which offers a variety of things to see around this beautiful city. Hop-on and hop-off at any of the 2 routes and 40 stops with just one ticket. Choose between a 1 or 2-day ticket to see and learn about the history of Barcelona on board the open-top double-decker bus. The bus is fitted with panoramic windows and anatomical seats to enhance your view while relaxed. Get free headphones to listen to the multilingual audio commentary, a guide map in hand with all the stops and routes, discounts and more. People with disabilities are not left out of the fun as the buses are suitable for them. You can enjoy skip-the-line entry to the renowned FC Barcelona Stadium and Camp Nou Museum which has some of the best collections of football memorabilia worldwide. A Ticket with free entry to F.C. Barcelona Camp Nou Museum. How Much is a 1/2/3 day F.C Stadium & Hop-On Hop-Off Bus Tours? Note: Infants under 4 years get on the F.C. Barcelona & Hop-On Hop-Off Bus Tours for free with the company of an adult. The F.C. Barcelona & Hop-On Hop-Off Bus Tour offers tourists another dimension of the city. The combo ticket gives tourists the ability to see this Mediterranean city on a hop-on-hop-off bus and a visit to Camp Nou Experience/museum with a memorable experience. The F.C Barcelona & Hop-On Hop-Off Bus Tour lets tourists travel across 2 routes (East/Green Route and West/ Orange Route) and an optional winter tour which takes place between November and March. Both routes cut across Barcelona's major attractions such as the F.C Barcelona Stadium, Placa d'Espanya, Museo Nacional de Catalunya, Casa Batllo, Placa Catalunya, Park Guell and many more beaches to see on the way. Tourists can hop on and off the open-top double-decker bus at any of the stops of their choice as many times as they wish to. Choose between a 1-or 2-day pass to enjoy the fully airconditioned hop-on-hop-off bus with free Wi-Fi, headphones to listen to the history of the city and its attractions in 16 languages. Marvel at the Sagrada Familia through the 360-degree panoramic windows or atop the bus for the 4-hours (2-hours per route) tour. This combo ticket also comes with a free map and guide of the city with the directions and stops in case tourists want to explore on foot, and discounts at local attractions. The buses are wheelchair adapted for people with disabilities. A stewardess is always available onboard to help tourists out with their needs, tourists will get access to the FC Barcelona Stadium with this ticket to show their football spirit. Is the F.C. & Barcelona City Bus Tours Right for Me? The F.C. Stadium & Hop-On Hop-Off Barcelona Bus Tours is right for both children and adults but not very suitable for people with reduced mobility due to a large number of staircases at the FC Barcelona Stadium. But they get to enjoy every bit of the open-top double-decker hop-on-hop-off bus tour, to see the sights around Barcelona. You get to enjoy an air-conditioned bus with panoramic windows and an open-top to marvel at the Sagrada Familia, F.C Barcelona Stadium, Placa d'Espanya, Museo Nacional de Catalunya, Casa Batllo, Placa Catalunya, Park Guell, beaches around the city and more. You get to enjoy the live commentary on board the bus in 16 different languages through free headphones, a city map and guide with directions around the city's top attractions and discounts at local attractions as well. Choose between the 1 or 2-day combo ticket to explore FC Barcelona's Stadium and its museum to learn about the club and its greatest players such as Kubala, Cruyff, Maradona, Guardiola, Ronaldinho just to name a few. This is definitely an amazing way to capture good memories in Barcelona. Experience Barcelona and save money with a combined Hop-on Hop-off Bus and a visit to the Picasso Museum! See all the highlights of this beautiful Mediterranean city and its beaches. This open-top double-decker panoramic bus conveniently offers journeys across 3 routes (Red, Blue and Green routes) with over 45 stops. The bus offers free headphones to tourists to listen to the audio guide in 16 different languages. Hop-on and off at any of the stops to explore on foot and marvel at one of the most visited art museums in the world. Enjoy free Wi-Fi onboard the bus with just a 24-hour Bus Hop-on Hop-off bus and Picasso Museum tour combined ticket. A free Wi-Fi access onboard Wheelchair accessible tour bus with a sliding roof in case of rainfall. How Much is a 1/2/3 Day Picasso Museum & Barcelona City Bus Tour? Note: Infants under 4 years get on the Picasso Museum & Hop on Hop off Bus Tours for free with the company of an adult. Camp Nou and many more. Placa de Catalunya, Casa Batllo - Fundacio Antoni Tapies, Passeig de Gracia - La Pedrera, Francesc Macia - Diagonal, Estacio de Sants, Creu Coberta, Placa d'Espanya, Caixa Forum - Pavello Mies van der Rohe, Poble Espanyol, Museu Nacional d'Art de Catalunya, Anella Olimpica, Fundacio Joan Miro, Teleferic de Montjuic, Miramar - Jardins Costa i Llobera, World Trade Center, Colom - Museu Maritim, Port Vell, Museu d'Historia de Catalunya, Port Olimpic, Zoo, Pla de Palau - Parc de la Ciutadella, and Barri Gotic. Placa de Catalunya, Casa Batllo - Fundacio Antoni Tapies, Passeig de Gracia - La Pedrera, Sagrada Familia, Gracia, Park Guell, Tramvia Blau - Tibidabo, Sarria, Monestir de Pedralbes, Palau Reial - Pavellons Guell, Futbol Club Barcelona, Diagonal Les Corts, and Francesc Macia - Diagona. Green Line (Seasonal Route - March - November). Port Olimpic, Platja del Bogatell - Cementiri del Poblenou, Poblenou, Parc Diagonal Mar (direccio Centre), and Forum Poblenou. The Picasso Museum & Hop on Hop off Bus Tour offers tourists the ability to see Barcelona and the worlds oldest Picasso Museum with a collection of over 4,251 works, including drawings, engravings, paintings, and ceramics, from 1890 and 1917 during Picasso's early years. This 1-day Hop-on Hop-off Bus Tour combo ticket enables tourists to journey through 3 bus routes (Red, Green, and Blue), which cuts across Barcelona's major attractions such as the F.C Barcelona Stadium (Camp Nou), Picasso Museum, World Trade Center, Placa d'Espanya, Sagrada Familia, Park Guell and many more. Tourists get a comfy experience aboard the open-top double-decker hop-on-hop-off bus with free Wi-Fi, air condition, free headphones to listen to the onboard audio commentary in 16 different languages and more. People with disabilities are not left out as the buses come with a ramp for easy access to people on wheelchairs. The Picasso Museum & Hop on Hop off Bus Tour also offers tourists a 360-degree panoramic view of Barcelona along each route for the 2-hours trip. This ticket gets tourists express entry to the Picasso Museum in Barcelona. Is the Picasso Museum & Barcelona City Bus Tour Right for Me? The Picasso Museum & Hop on Hop off Bus Tour is right for everyone who wants to explore Barcelona and learn more about its history. You get to enjoy 360-degree panoramic views aboard the Picasso Museum & Hop on Hop off Bus which is fully air-conditioned with free Wi-Fi. You can also decide to get a wider angle of the city on the upper deck of the open-top double-decker bus, there are free headphones provided for tourists to listen to audio commentaries about the city's past and its top attractions in 16 different languages. This 24-hours Picasso Museum & Hop on Hop off Bus Tour ticket grants you express entry to the Picasso museum and 1-hour per line for the hop-on-hop-off bus. You can hop on and off the bus for as many times as you want, this combo-ticket also come with discounts worth over €200, Barcelona city map and guide with the routes, stops and top attractions along each route.